Cantor Randy Herman is equal parts clergy and performer. The accomplished singer, pianist and hazan displayed both sides Sunday at the 48th Annual AJ Music Festival. The show, titled “In the Key of Play: Rock & Reparte,” delighted the audience of some 250. On this night, Herman, Lipp, Cantor Sharon Hordes, student Cantor Mike Jarvis, vocalist Jennifer Diamond, Louisville Orchestra Music Director Teddy Abrams and the Jewish Community Choir held the stage by themselves, singing pop songs and show tunes from all genres, while Herman showcased his own compositions. One of his standout pieces, “King David’s Spaceship,” a whimsical song about a boy who imagines the great Jewish monarch flying through the heavens in his own spacecraft, was made into a animated video by AJ’s own Yehuda Husband. The video premiered at the festival. Even Herman, who sprinted down the aisle after the screening to hug Husband, swore he hadn’t seen it before. The rest of the show was split between classic hits selected by the performers and Herman’s own work. Abrams accompanied Herman on clarinet for a honkytonk tune the cantor called “Yofi Tofi” (Hebrew for Super Duper). “Ptach Libi” (Open My Heart), an unplugged number, brought Lipp on the guitar together with Herman. And “Ahava Rabbah” (Great Love) showed the cantor could rock. “This is what happens when a yid goes a little crazy and thinks he’s Ray Charles,” Herman quipped. He also performed with the Jewish Community Choir on “Hine MaTov” and the slightly comical “HaKohen Gadol” (The Great High Priest). Much of the music any baby boomer could dig. In a nod to St. Patrick’s Day, Lipp also sang “Danny Boy” – slightly altered for a Jewish crowd. Herman comes by his musical chops honestly. The grandson of vaudevillians, the Grand Rapids, Michigan, native studied theater and … psychology at the University of Michigan. He has recorded his own CDs and worked as a musician and actor in Europe and America. 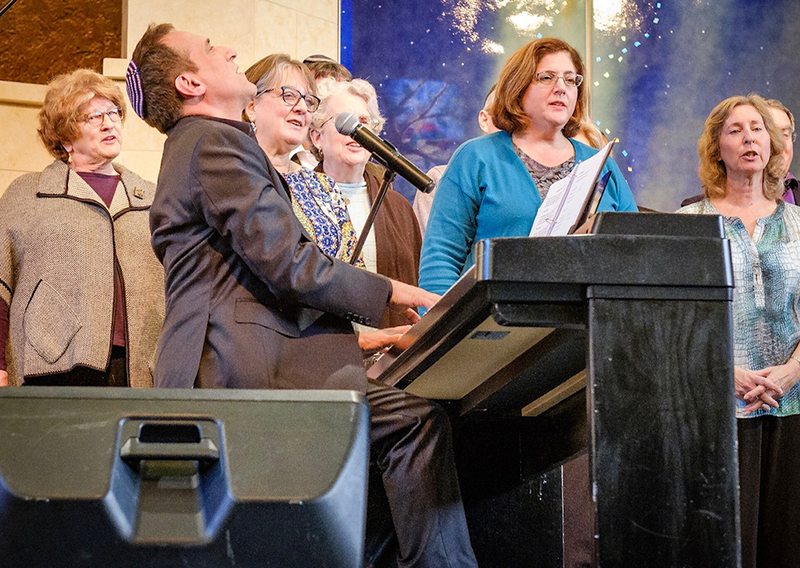 He was invested as a cantor in 2008 by the Jewish Theological Seminary. Late in the show, Herman tugged at the hearts of Jewish parents everywhere when he sang “Nicole,” a romantic melody he wrote for his wife. He got married in his 40s, putting an end to his parents’ angst over when he would settle down. A photo gallery of the happy couple flashed on the screens as he sang. So what did he do for an encore? He sang Stevie Wonder’s “Isn’t She Lovely” as photos of Herman’s daughter, Kaya, were projected.